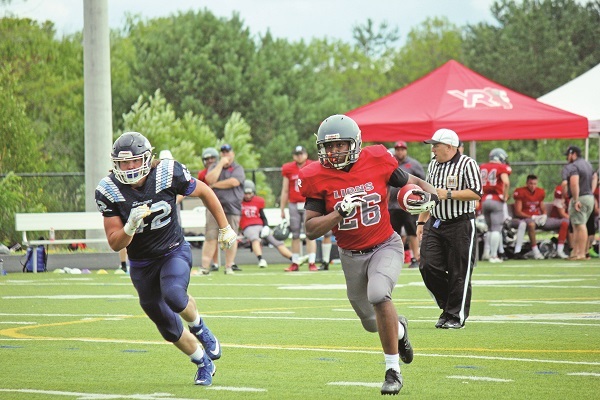 The Varsity York Legion Lions roared through the Ontario Football Conference in 2018, only to be muffled in week one of the post-season. The league’s second-best defense clashed with the league’s top offense in a battle between the Lions and Oshawa Hawkeyes at St. Max Kolbe field on Saturday, with the Hawkeyes’ high-flying passing game coming out on top 28 – 9. Up 9 – 7 late in the first half on field goals, the Lions took a rare deficit into the second half after the Hawkeyes hauled in a long touchdown pass with just over two minutes left on the clock. Turning over the ball in less than a minute after a pair of tipped passes on the next drive, the Lions were able to salvage a 14 – 9 score heading into the break thanks to a late blocked field goal attempt on their own 38-yard line. With Oshawa on the receiving end of the second half’s opening kickoff, it was their running game that brought the return into Lion territory, before forcing York Region to begin their drive on their own six-yard line. Oshawa made it an eleven-point game late in the third, stumbling in from two yards out while failing to convert the extra point. York’s most opportune moment for a comeback came on the following drive, beginning on the Oshawa 39-yard line after a long return. After a face masking call put the Lions on the Oshawa nine for the opening play of the final quarter, the desperate Lions failed to convert on a third-down pass to the end zone. Earning possession back deep in their own end, the Hawkeyes moved the chains all the way down the field for another converted touchdown for a final score of 28 – 9. The clock ran out on the Lions’ season when an interception in the Hawkeyes’ end zone led to a touchback in the final few minutes. Oshawa moves on to face the undefeated Scarborough Thunder in the varsity semifinals. The Junior Varsity Lions narrowly missed the postseason by just two points, finishing with a 5-3-0 record. They closed off their season on a strong note with a 42 – 0 win over the Brampton Bulldogs in late July. The Bantams closed out their season on July 21 with a 6 – 0 win over the Etobicoke Eagles, ending their season at 3-5-0.